During the new construction process, the need to have all the necessary materials to get the job done, including construction adhesives, becomes quickly evident. Having a consistent supplier of that material can help expedite the completion of a job. It’s important to remember that there are different construction adhesives that work well in specific situations. 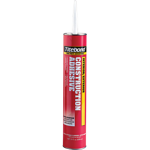 An interior/exterior adhesive has a versatility that prevents water leaks and can be a godsend when colder temperatures hit. It works best with metal, foamboard, wood or paneling, drywall, tub surrounds or ceramic tile, and takes roughly 15 minutes to apply to a ¼” bead. In this situation, only one side needs to be bonded, though some temporary nailing or bracing might be required. That improves the contact and allows the adhesive to dry, but it has to cure overnight to be most effective. Also, it shouldn’t be applied over wallpaper or to polystyrene in very hot weather. When it comes to any type of polystyrene or plastic foams, a multi-purpose adhesive is the right call. Due to the rapid bond development and initial tack it offers, it should definitely be used for any type of vinyl covered gypsum board due to the fact that blistering, bleeding or staining will be non-existent. The multi-purpose brand offers strong heat resistance that works best with a fire-rated wall and partition designs, though one surface should be porous. The method of applying can use either the spot (for rough surfaces), extruded bead (for smooth and level surfaces) and trowel (for specialty applications that need immediate holding power). The best place to find either interior/exterior or multi-purpose construction adhesives is by ordering through the Basic Components website.